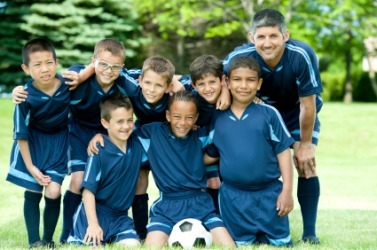 A soccer team in their uniforms. Uniform means having the same form, manner, style, etc. An example of uniform is a row of students walking in a straight line. The definition of a uniform is a certain outfit that members of a group must wear. An example of uniform is what Catholic school students must wear. Uniform is defined as to provide with an outfit that all members of the group must wear. An example of uniform is to provide army officials with the clothes they must wear. "uniform." YourDictionary, n.d. Web. 24 April 2019. <https://www.yourdictionary.com/UNIFORM>. wearing a uniform; esp., wearing the military or law enforcement uniform appropriate to one's organization, rank, etc. Always the same, as in character or degree; unvarying: planks of uniform length. Being the same as or consonant with another or others: rows of uniform brick houses. A distinctive set of clothing intended to identify the members of a specific group: a police uniform. To clothe in a uniform. The letter U in the ICAO spelling alphabet.